The breathtaking Reed Flute Cave, located 5 kilometers (3 miles) from the city of Guilin in Guangxi, China, is named for the reeds that grow outside the entrance which can be made into flutes. 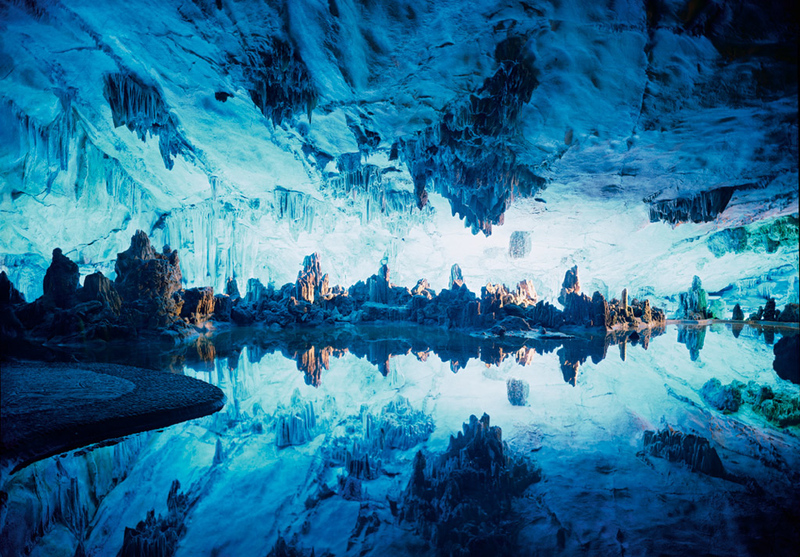 The natural limestone cave is lit with multicolored lights, creating an otherworldly landscape of beauty. The cave itself is over 180 million years old, and has seen visitors for over 1200 years, which is known due to the existence of over 70 ink inscriptions inside the cave, dating back to 792 AD in the Tang Dynasty. Visitors can take an hour long walk through the cave on a U-shaped path to observe the impressive stalagmites, stalactites, and limestone columns that have formed. Also, there is a lovely park outside the cave, with gardens, pagodas, ponds, and peaceful pathways. Wow… That is breathtaking. So close to where I’m from (Hong Kong) and yet I have never been lucky enough to visit. Finding it so hard to believe that these stunning colors are natural..